##http://walksf.org/2014/01/no-loss-of-life-is-acceptable-san-franciscans-call-for-vision-zero/##Walk SF## shows that with a Vision Zero philosophy, increase traffic volume can lead to fewer road fatalities. “Vision Zero” began in Sweden. 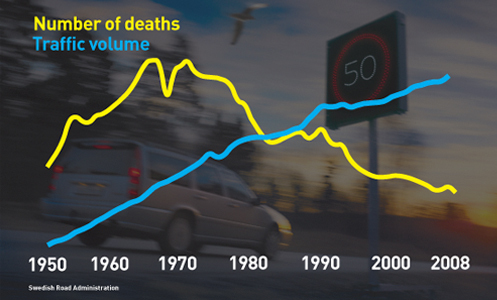 In the 1970’s, Sweden decided that the amount of traffic deaths was too great, so it began to base every transportation design, construction and enforcement decision around a basic premise: “will it help reduce Sweden’s total traffic deaths to zero?”. 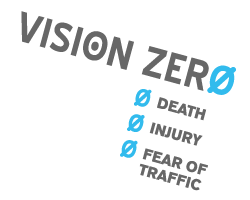 In New York, ##http://transalt.org/issues/enforcement/visionzero##Transportation Alternatives## offers a simple explanation of Vision Zero. In addition to safety enhancements and education, would there be an accountability component – such as, in the event of a collision, would the city investigate the infrastructure surrounding the incident to determine if it needs additional treatment? I’ve seen this occur after some car/ped collisions (such as the crosswalk on Eagle Rock Blvd near Verdugo, where an elderly man was hit and killed a couple months ago – now the crosswalk is slated to be revamped). It seems like if we implement a Vision Zero policy, then there should be specific action taken after each incident. Agreed. I’ve long argued that any traffic death, especially those involving a bicyclist or pedestrian, should require an investigation to determine if the existing laws and infrastructure contributed to the death in any way, and what can be done to prevent such incidents in the future. And thank you for this, Damien. Is it just coincidence that the fatality rate in the European Union countries is half that of the US, while the price of “petrol” in those countries is twice that of the US? I thought we had Vision Zero when cyclists from all over were “Storming the Bastille” or staging Die-ins where ghost bikes were being installed. These actions really mirrored what the Dutch were doing back in the 70s. Then we declared victory and stopped. We need the equivalent of a ‘Public Playground Safety Handbook’ for street-related liability — including infrastructure (lacking or otherwise inappropriate). This might then stop this outrageous behavior from entitled motorists who see themselves as judge, jury, enforcer, and fundamentally in the right — when they are in fact perpetrators and sometimes murderers. That graph commits two transgressions: 1) An unlabeled y-axis, and 2) Two types of data with different units on the same plot. 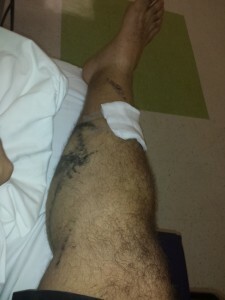 Walk SF should be taken to task, ESPECIALLY if you agree with the point they are trying to advocate.